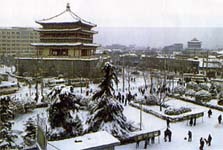 Xi'an, the capital of Shaanxi Province, was called Chang'an in ancient times. It is situated in the central part of Weihe Plain, with the Weihe River flowing in the north and the Qinling Range rising and falling in the south. The city is the political, economic, and cultural center of the northwest and has rich cultural heritages that witness the social changes at different historical stages. More than 4,000 historical sites and tombs have been excavated and over 120,000 historical relics unearthed. Among the famous tourist spots are the City Wall, the Forest of Stone Tablets, the Drum Tower, the Bell Tower, the Guangren Temple, the Ruins of E'pang Palace, and the Mausoleum of Qin Shi Huang. Erected during the Ming Dynasty (1638-1644), it is the world's largest and best-preserved ancient fortress. The rectangular city wall is 13.7 kilometers in circumference and has 5,984 crenels and 98 places for the garriosn troops to stay in. There is a gate in each of the four sides, and each gate consists of a main tower, an embrasured watchtower, a lock tower, and a compound. The city wall is surrounded by a moat and a ring road lined with trees and dotted with pavilions and kiosks to form the huge Around-the-City Park. It is on the northern side of West Avenue in the city proper, facing the Bell Tower across a distance. It measures 33 meters in overall height and its rectangular base is built with grey bricks. The stairway looks dignified and steady. In ancient times, a big drum hanging on top of the tower was used for telling time. Standing at the 1, crossing of the East, West, South, and North avenues in the city proper, the Bell Tower is a three story wooden structure topped with dark green tiles. It is a grand ancient building with traditional Chinese architectural features. Towering at the southern tip of Yanta Road outside Heping Gate, the brick pagoda, a reconstruction of the Ming Dynasty, has seven stories and is 64 meters high. A handrailed stairway inside spirals to the top. The pogada is a major historical relic under protection in China. A Tang Dynasty (618-907) brick structure in the Jianfu Temple in southern Xi'an. Originally, the pagoda had 15 stories. The top two stories were damaged in an earthquake, and the remaining 13 stories now stand at 36 meters. A flight of wooden stairs inside the pagoda leads to the top. There is a 1,000-kilogram iron bell in the temple, known as the Morning Bell of the Wild Goose Pagoda. Five kilometers east of the Lintong County seat, in the vicinity of Xiahe Village, is the tomb of Qin Shi Huang. The mound is 55.05 meters high and 2,000 meters in girth. The imposing cemetery, with a novel layout, is divided into the inner and outer cities and has an unprecedentedly great wealth of cultural relics. It was included into the List of World's Cultural Heritages. Located 1.5 kilometers east of the tomb of Qin Shi Huang, Pit 1 is 230 meters from east to west, 62 meters from south to north, and five meters deep. It is referred to as "the No.8 world's wonder" and the largest military museum in the world. The pit houses 6,000 life-size painted terracotta warriors and horses. The warriors, arranged in battle formation, wear helmets and armor and carry weapons. They are dignified, and each has a different manner. The park sprawls at the northern foot of Zhongnan Mountain, 15 kilometers southeast of the Zhongzhi County seat in suburban Xi'an. It is named after Louguan Tower which is held by Taoists as "the No-1 place under heaven where immortals live." Louguan Tower is known not only for its historic relics but also for its enchanting landscapes of hills covered with verdant trees and tall bamboos and clear waters. Vegetation around the temple tops the list of vegetation in Zhong Mountain. At the nouthern foot of Mount Lishan 30 kilometers east of Xi'an, Huaqing Pool is one of the well-known hotsprings in Shaanxi Province and a tourist attraction known in and outside of China. 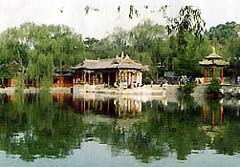 The pool is tucked away among green pines and cypresses and embellished with pavilions, towers, and kiosks, which are linked by twisting corridors and paths. One of the main peaks of the Qinling Range, it towers 1 ,700 meters above sea level 40 kilometers south of Xi'an. The mountain consists of Mount Cuihua, Mount Nanwutai, Mount Guifeng, and Mount Lishan, each has its own rising peaks and an enchanting scenery. The park extends for 54,000 hectares 120 kilometers outside Xi'an, along the borders of Meixian, Taibai, and Zhouzhi counties. Mount Taibai, the highest peak of the Qinling Range, features steep peaks of strange shapes, virgin forests, and traces of glaciers from the Quaternary Period.